Assigning team members and leaders to multiple teams – so that they dip in and out of projects according to when their time and expertise is most needed. minimising downtime and associated costs. knock-on effects from issues in one project impacting on resource availability for others. Mark Mortensen and Heidi Gardner’s article “The overcommitted organization” in the September – October issue of Harvard Business Review (pages 58-65) has some facts and data about the extent of “multi-teaming” in organisations. They have studied hundreds of teams in a range of sectors (including professional services, oil and gas, high tech, consumer goods) over a period of 15 years. Apparently at least 81% of more than 500 managers in global companies reported “multi-teaming” as a way of life, with people involved in as many as 6 to 15 projects in a week. My own empirical observation in working with teams in the Life Sciences, and in Library and Information Management, is that “multi-teaming” is also a way of life, although the number of projects that people are juggling is generally not quite as high! Mortensen and Gardner provide some very useful tips on how to address the associated challenges of “multi-tasking”, which also reinforce the points we share in RiverRhee’s training on team and project management. We know that the most effective teams are those that not only have a clear idea of their purpose and individual members’ roles, but have spent time developing the relationships with the team. Our experience that the most effective way to set the team on the right path is to have a kick-off meeting or launch, and ideally face-to-face. This enables people to start to get to know each other, and from there, as emphasize Mortensen and Gardner, comes trust and accountability. In fact, they maintain that having a team launch can improve performance by up to 30%. An emphasis on building the team also helps people to feel that they “belong” to each team that they are working on – something that we know can be a very strong motivator for many people. For team leaders, understanding what motivates each person will help them to boost and maintain motivation. Mortensen and Gardner also say that it is worth doing a team launch even with team members who are already familiar with each other as every new project is likely to bring new requirements and skills into play. They advocate mapping everyone’s skills – both technical and soft, along with wider areas of knowledge. This ensures that everyone is aware of who can bring what skills to bear, that they consult each other accordingly, and also hold each other accountable for quality. This also builds on what we know from using personality tools such as MBTI (Myers Briggs Type Indicator) and Belbin Team Roles to understand and optimise the interactions between team members. This is probably the most important issue for many team members and leaders. We often hear of people’s frustration as the time they thought they had for one project gets squeezed by demands from another. In a RiverRhee newsletter on Project Management, we shared our advice for using explicit project charters for agreeing the time that each person would spend on each project. This is very much a starting point but it opens up the conversation, and many organisations then use portfolio review meetings to further address changes in priorities and requirements on people’s time. visual tools such as the video on Skype or Facetime for individual one-to-one check-ins can help to pick up body language cues for instance around stress, motivation, understanding etc. We put a big emphasis on the importance and benefits of sharing learning and how to do it for creating excellence in project management, so it was good to see the HBR authors highlight this too. As they say, learning is something that can suffer when people are pushed for time. It is also an important motivator for many people. We stress the importance of scheduling a close-out meeting as part of the project plan to ensure that learnings are reflected upon and actions agreed for sharing and addressing them. The HBR authors have some additional, perhaps less commonly identified, organisational strategies for addressing the challenges of “multi-teaming”, and so decrease risk, and increase innovation. These strategies focus on ensuring a good understanding of and actively managing the spread of people across teams. Many organisations use some form of FTE or resource management system to understand who is working on what project, and how much time they are devoting to each. They mainly use this for accounting purposes – for example so that costs to clients can be more accurately calculated. Mortensen and Gardner suggest that this mapping of resources should also be used to understand and manage the associated risks and opportunities from “multi-teaming”. So for instance if the overlap of members between teams is large, there is a greater risk of knock-on shocks from one project to another. With an accurate mapping of team membership, project or senior managers could anticipate these risks and develop mitigation plans. If the overlap between members of projects is small, and the organisation values knowledge sharing between projects, then the expectation (or culture) and approaches for the transfer of learnings and good practices could be made more explicit. The authors also suggest that, if the nature of the tasks or the culture between different project teams is very different, it will be harder for members to transition from one to the other. Understanding the overall map of resources to teams would therefore alert project, line and senior managers in these situations to put a greater emphasis on the on-boarding and team building activities. Organisations who have designated portfolio managers, or project management offices (PMOs) could take on many of the recommendations listed above. However, many of the smaller Life Science organisations, and Library and Information Management services that we deal with do not have this luxury. Individuals in HR or IT could also have designated roles to monitor the various aspects of “multi-teaming”. Elisabeth Goodman is the Owner and Principal Consultant at RiverRhee Consulting., a consultancy that specialises in “creating exceptional managers and teams”, with a focus on the Life Sciences. (We support our clients through courses, workshops and personal one-to-one coaching.) Elisabeth founded RiverRhee Consulting in 2009, and prior to that had 25+ years’ experience in the Pharmaceutical Industry in line management and internal training and consultancy roles supporting Information Management and other business teams on a global basis. RiverRhee is a support supplier for One Nucleus and a CPD provider for CILIP (Chartered Institute for Library and Information Professionals). Elisabeth is accredited in Change Management, in Lean Sigma, in Belbin Team Roles, MBTI (Myers Briggs Type Indicator) and is an NLP (NeuroLinguistic Programming) Practitioner. She is a member of CILIP and of APM (Association for Project Management) where she was a founding member of the Enabling Change SIG. It seemed obvious from the moment that our facilitator, Andy Smith (Coaching Leaders), mentioned it at the start of the two day course on Appreciative Inquiry (AI) that I attended this week. The minute you ask someone, or a group of people a question, you have influenced their mindset. Ask them what they like about something, or what is going well, and the chances are they will relax, open up and be in the mood to be creative. Ask them what’s not working and they may get defensive, close up and descend into despondency. That’s a simplification of course as people may want to air their problems before they can open up to explore solutions, and they may automatically rise to the challenge rather than wait to be asked the right question. But the general premise of AI is to focus on what’s working well, on what people do best and on everyone’s potential to do so much more and better. Asking the right, open, positive questions will enable this to happen. There are implications for coaching and personal development, for team building, for problem solving, decision making, innovation, knowledge and project management and for managing change! This blog just highlights a few of the ways to do this. There’s obviously a lot more about this that I will weave into RiverRhee‘s work and that you can find out about from some of the references below. Define the topic to be explored in an affirmative way: so it is stated in terms of what you want to move towards, rather than the problem to be moved away from. Focus on the vision and your mind and body will be already working out creative ways to achieve it. Discover all the things that you are already doing well towards achieving that vision. This is where the affirmative questioning really starts to kick in. Dream what it would be like when you achieve that vision: what will you hear, feel, see, think? What would it be like if a miracle happened overnight? This step engages the emotions: the heart as well as the mind and creates a really compelling vision. Design all the possible alternatives (without evaluating at this stage) for achieving the dream. Build on what’s going well and stretch beyond that. Deliver – this is the point at which you evaluate the alternatives and decide on the next steps to achieve your vision. People familiar with the GROW and T-GROW models of coaching will have spotted that define equates with setting the topic (T) or goal (G). Discover equates to reality (R) but with a focus on what’s working well rather than on what’s generally happening. Dream is an enhanced version of the goal. Design equates to options (O) but holding back on evaluating those options. Deliver equates to will ( W ). The slightly different order of the AI five-step process means that the aspirational vision or dream can build on the positive mood generated and so be more creative than the early definition of the goal permits in the GROW model. Although, in practice, either model can be iterative in a coaching situation. The five-step model could also be used with a group of people in a team situation, to explore how a team can become more effective and attain, or sustain high performance. It could be used ‘live’ within a workshop, as an alternative to using pre-workshop diagnostics or temperature checks as described in some of my previous blogs for team development. So the team can define in real time what it wants to achieve, discover all the things it is currently doing well, dream of what it could do, brainstorm how it could get there (design), and then agree the actions to take forward (deliver). The team could use rating scales (1 to 5, 1 to 10 etc) at any point in this discussion to make their assessments and goals more tangible. As the previous sections demonstrate, the five-step model has built in approaches to aid with problem solving, decision making and innovation. Focusing on what has gone well and using the dream steps arguably allow people to go beyond just fixing the problem into new realms of creativity. Apparently others have already explored how to apply AI in Lean and Six Sigma, and I shall look into this more. Certainly, exploring what has gone well and why, in the Measure and Analyse phases of the DMAIC are possibilities that I do already touch upon in my RiverRhee courses. We also sometimes use ‘blue sky’ thinking to imagine a ‘to be’ way of working in the Improve phase. De Bono’s Six Thinking Hats, and the SWOT (Strengths, Weaknesses, Opportunities, Threats) analysis also encourage equivalents to the Discover step (yellow hat, and Strengths respectively), the Dream step (green and Opportunities), and Design (green again, and the actions arising out of the SWOT analysis). Andy also mentioned SOAR (Strengths, Opportunities, Aspirations, Results) as an affirmative alternative to SWOT and which should give more scope for the Dream step! Finally, knowledge management techniques will obviously benefit from AI, especially as having a productive conversation is at the heart of sharing knowledge between people. After Action Reviews, Learning Reviews or Retrospects (or Lessons Learned exercises in Project Management) already explore what went well. So AI techniques and philosophies would enhance the outcomes in these areas too. Last but not least, AI has something to offer those leading or dealing with change and so support one of my missions which is to create ‘navigators‘ as opposed to ‘victims’ of change! We can aim to understand and look for ways to maintain, enhance, or at a minimum, compensate for the best of what people previously had in creating whatever the new situation might be. And we can ensure that that new situation is as compelling a vision or ‘dream’ as possible. There are lots of opportunities to apply Appreciative Inquiry tools and ways of thinking in our working and home lives. I am using some of these applications already, and looking forward to exploring more with with clients, colleagues, friends and family! I’ll try not to be a “rose-tinted evangelist” though: we still need to acknowledge the very real problems and challenges that people experience and how they feel about them. How might you apply AI? Elisabeth founded RiverRhee Consulting in 2009, and prior to that had 25+ years’ experience in the Pharmaceutical Industry in line management and internal training and consultancy roles supporting Information Management and other business teams on a global basis. RiverRhee is a support supplier for One Nucleus, a quality assured training provider with Cogent Skills and a CPD provider for CILIP (Chartered Institute for Library and Information Professionals). She is a member of CILIP and of APM (Association for Project Management) where she leads on Membership, Communications and Events for the Enabling Change SIG committee. I had the pleasure of co-presenting a seminar with Carl Halford recently, for the APM (Association for Project Management) Thames Valley Branch, on behalf of the Enabling Change SIG. The full set of slides and the notes from our event: Process Improvement and Change Management are available on the APM website. The Kano model is traditionally used in Lean and Six Sigma as a ‘Voice of the Customer’ tool, to understand customer requirements, and to distinguish between the ‘critical’ versus ‘nice to haves’. Carl used the model for a lively interactive exercise with the delegates, using a dry cleaning business as the basis for the discussion. Carl’s demonstration was a helpful reminder of how effective the Kano model can be as a tool for stakeholder analysis. As he said, there can be no debate about the ‘must-haves’, or critical requirements. If these are not satisfied, then those customers will never come back, and word-of-mouth could be your ruin. The ‘more is better’ line (which I had learnt about as the ‘it depends’ requirements), are those that may make a difference to customers depending on their circumstances or what else is going on in the store on any particular day. The ‘delighters’ are the ones that will win your customers’ loyalty, and cause them to recommend you to others. Of course these ‘delighters’ are also a risk to managing your long-term resources as they may in time become expected ‘must-haves’. What especially peaked my interest was Carl’s suggestion that the Kano model could also be used for team building. A team might have traditionally used the Kano model as part of a team meeting: to help extract what everyone already knows about their stakeholders, and to agree what other research or conversations might be needed to enhance that understanding. Using the Kano model for team building works on the premise that each team member is a stakeholder in the team’s success. Carl mentioned that he tends to use the model for project teams, but it could also be used for an operational team. Each person is likely to have uniques ‘must haves’, ‘more is better’, and ‘delighter’ expectations. There will also be some overlaps between what different people want. I can imagine preparing a wall poster of the Kano model, and issuing each team member with post-it notes to provide the basis for a rich discussion and enhanced understanding of the various perspectives within the team. If managed well, this might help the team through its ‘storming’ phase of development and pave the way for greater trust and support. 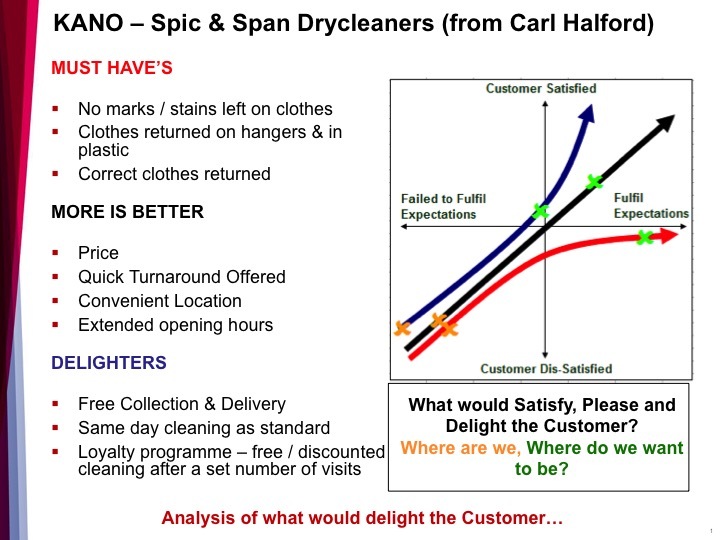 I’m looking forward to giving this alternative application of the Kano model a try, and of course will be curious to hear about anyone else’s experience of this approach. Elisabeth founded RiverRhee Consulting just under 6 years ago, and prior to that had 25+ years’ experience in the Pharmaceutical Industry in line management and internal training and consultancy roles supporting Information Management and other business teams on a global basis. She is a member of CILIP (Chartered Institute for Library and Information Professionals) and of APM (Association for Project Management). I recently graduated from Advance Coaching Consulting‘s and Magenta Coaching Solutions’ 7-day NLP Practitioner course in Cambridge. It was a wonderful opportunity to explore some new resources for my work as a trainer, coach and consultant whilst also achieving some invaluable personal developments. We discovered that the opportunities for applying NLP for enhancing individual and team performance are extremely diverse. In this blog I will use examples of what we learnt to explore how a trainer could apply NLP tools and techniques when working with teams to enhance their effectiveness. How could NLP be applied to a trainer’s work with teams? 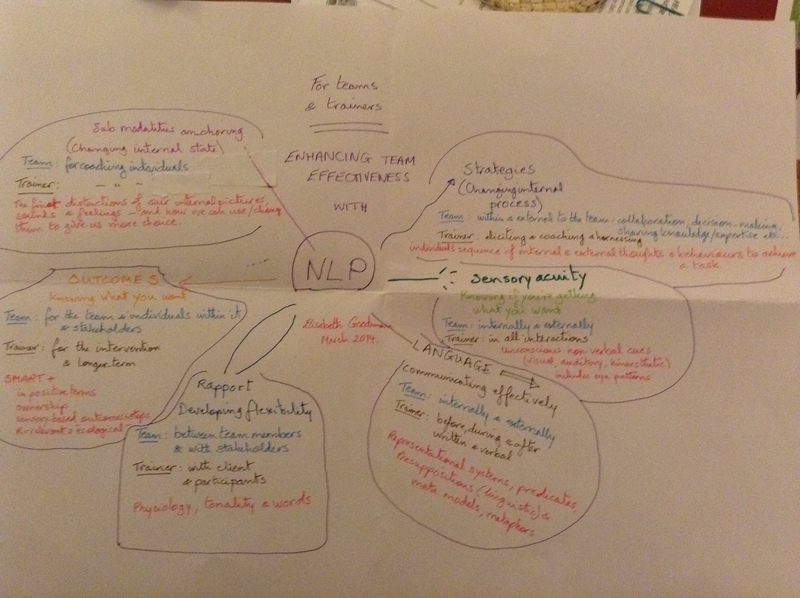 There are many courses and books devoted to the subject of training with NLP so this is very much a snapshot from my practitioner’s learning and experience so far that I have captured in my mind map. The headings in the mind map are courtesy of Bevis Moynan who ran the course alongside Lorraine Warne. The last bullet point in particular starts to get into very deep material, and is an area we each personally experienced during the course, and which Lorraine also applied in my follow-up one-to-one coaching session with her to great effect. Whether we are choosing an item in a shop, or carrying out a complex surgical operation there will be a sequence of internal and external behaviours that determine our approach. Many of these will be subconscious. As with driving a car, we may once have consciously learnt the steps involved, but once we are skilled in them they are simply automatic. A trainer wishing to enhance the work of teams could use NLP techniques to help them break down and identify the sequence of steps they use for all aspects of their work. They would go beyond the obvious steps in an SOP to the more individual thinking patterns, emotional responses and behaviours involved for example in how they collaborate, share their knowledge and expertise and make decisions. In this way the team could choose to change and improve on their performance, and also more consistently replicate what they are already doing well. We know that the words people use are only a small proportion of how we communicate. Tone of voice and body language account for the rest. On our course we also practised picking up even smaller visual cues such as changes in breathing patterns, skin colour and facial movements. These are signals that we might normally detect subconsciously in our interactions with others. With more practice and attention our sensory acuity can become an even better resource for team members who are aiming to achieve a high performing teams. This subject is vast! We explored such topics as representational styles and predicates, linguistic presuppositions, meta models and the use of metaphorical storytelling, all of which can enhance how team members communicate amongst themselves and with their stakeholders. We can make our communications more effective by listening out for other peoples’ linguistic cues, and using some of them in return. It may aid their understanding of something we are trying to explain. Although we might not encourage team members to be quite so direct in their responses, having a greater awareness of what is happening in these kinds of communications could enhance team interactions. Finally, we had great fun experimenting with the use of metaphorical stories to convey an underlying message and also to create atmospheres that are conducive to learning. We are conditioned from childhood to enjoy and pay attention to stories. Being able to create and use metaphors and weave in the different predicates, as well as using different tones of voice and body language are powerful features of good storytelling. Storytelling is an approach that is already being used in business for such things as knowledge sharing, and managing change – important aspects for enhancing team performance. All of the tools that I’ve already described in this blog can be effectively used to build rapport within a team and with their stakeholders. Paying attention to and matching the words, tone of voice and body language in normal conversation will rapidly enhance the relationship between people. However if it’s too obvious it could backfire as people may think you are either making fun of them or manipulating them! We did not explicitly discuss how to apply rapport in conflict situations so this is an area for me to reflect on further..
Anthony Robbin’s book, “Notes from a friend”, was one of the ones on our pre-course reading list. He graphically described how focusing on what we don’t want – such as not to crash into a wall when going into a skid – will invariably focus our attention and result on us crashing into that wall. So we were encouraged to articulate goals that we would like to achieve in terms of a positive outcome that we were personally accountable for, to represent it as powerfully as possible in visual, auditory and kinaesthetic terms, and to also break it down into the steps for getting there. This is essentially an enhanced version of writing the strategic and tactical goals of a team, or individual SMART objectives. This really starts to get into Master Practitioner territory! However we did explore our finer internal representations of likes and dislikes, and states of mind, and were guided through different techniques for ‘reprogramming’ ourselves. Classic examples are reducing anxiety before presentations, helping with anger management, reducing long-lasting sadness. These types of applications will be more appropriately addressed in one-to-one coaching rather than as a general team building activity. So what if you were to apply some of these NLP approaches to enhance team effectiveness? You may already be doing so either consciously or unconsciously, and might have called your approach by a different name. If so there may be something here to help you do this even better. If much of the above is new to you, what could you try? What difference might that make to your work? As ever, I’d love to hear from you, read your comments, share your experiences and learn from you too! Elisabeth Goodman is the owner and Principal Consultant of RiverRhee Consulting and a trainer, facilitator, one-to-one coach, speaker and writer, with a passion for and a proven track record in improving team performance and leading business change projects on a local or global basis. Elisabeth is an expert in knowledge management, and is accredited in change management, Lean Six Sigma and MBTI (Myers Briggs Type Indicator). She has a BSc in Biochemistry, an MSc in Information Science, is a full member of the Chartered Institute of Information and Library Professionals (CILIP) and of the Association for Project Management (APM) and is also a Growth Coach with the GrowthAccelerator. Elisabeth has 25+ years’ Pharma R&D experience as a line manager and internal trainer / consultant, most recently at GSK and its legacy companies, and is now enjoying working with a number of SMEs and larger organisations around the Cambridge cluster as well as further afield in the UK and in Europe.